What is the Eatwell™ 5-Meal Pet Feeder by PetSafe®? The Eatwell™ 5-Meal Pet Feeder by PetSafe® is an electronic automatic pet feeder that conveniently feeds your pet at timed intervals. The easy-to-use timer can be set to provide your pet with a perfectly measured portion of dry food at the time you choose. The dishwasher-safe removable tray holds five 1-cup meals. No longer will you overly worry about being home on time to feed your hungry pet. Set the timer for your pet's favorite breakfast time and you may even be able to sleep in! The Eatwell™ 5-Meal Pet Feeder by PetSafe® is also great to help keep your pet on a regular feeding schedule and prevent overeating. You can set it to feed your pet up to 5 small meals per day, one meal per day for 5 days or any schedule you choose. The durable, BPA-free plastic feeding unit runs on 4 "D" cell batteries (not included). Battery life for operation of the Eatwell™ 5-Meal Pet Feeder by PetSafe® is approximately 12 months. 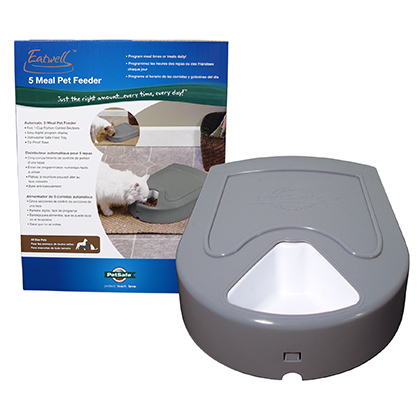 Also available is the Eatwell 2-Meal Pet Feeder by PetSafe®. Simply fill each compartment of the round serving tray with dry food, set the timer to the preferred feeding schedule using the programming buttons and close the lid. The first feeding portion will be available to your pet immediately. The tray will rotate to the next feeding portion(s) at the time(s) you have scheduled. Do not overfill food cups, as this could inhibit proper rotation of the food tray. Use with dry food only. For in-depth instructions, please read the Eatwell™ 5-Meal Pet Feeder by PetSafe® manual. Install the Batteries: Open the Lid to the Eatwell™ 5-Meal Pet Feeder by PetSafe® unit. Remove the Battery Compartment Door. Place 4 "D" Cell batteries (not included) into the Battery Compartment as shown on the Installation Label. Set Time of Day: On the control panel, press Clock, then press Set until the hours flash. Press Increase or Decrease to set the hour (Note AM or PM). Set the First Daily Timed Feeding : (Note: The first food compartment is available to your pet at this time.) Press Clock, then press Increase until the Daily Feeding Time Indicator displays (!)1. Fill the Food Tray compartments with food. Note: Overfilling may cause the Feeder to malfunction. Place the Food Tray onto the Hub. Press Manual Advance to advance the Food Tray into position. Close the Lid so that it latches. Place the Feeder on the floor. Set Additional Feeding Times (if your pet eats more than once a day): Press Clock, then press Increase to display the next Daily Feeding Time [ (! )2, (! )3, (! )4 etc.]. Repeat steps 8-12 for each programmed feeding. Remove a Programmed Feeding Time: Press Clock, then press Increase until the Daily Feeding Time you wish to remove is displayed. Suspend Feeding (but retain the program): Press and hold Suspend Feeding for 7 seconds, then release. The Suspend Feeding Icon will appear in the upper right corner of the Clock Display. Note: The : symbol between the hours and minutes on the Clock Display flashes once each second. Resume Feeding (at the programmed times): Press Clock. The Suspend Feeding Icon will disappear from the upper right corner of the Clock Display. Turn the Feeder Off: Remove batteries. Approximately 13" x 16" x 4"
Product Materials: Durable BPA-free plastic construction, removable dishwasher-safe food tray.